At a time when the shell of the earth has cracked and the ocean heaved a mortal wave upon a shore of vulnerable nuclear plants, a small miracle is playing out in the biggest river of the American West. Spring Chinook salmon, the alpinists of the maritime world, are following biological imperative and climbing their way up the Columbia to spawn and die. They are returning from a life in the distant Pacific, swimming home to a grave in gravel, some going almost 1,000 river miles inland. Chinook are the largest salmon, easily the most tasty, and perhaps the most imperiled. Given the demand for salmon, it is no surprise that a Frankenfish has emerged -- a lab-created hybrid that could soon become the first genetically engineered animal approved by the Food and Drug Administration for human consumption. The company behind these manufactured fish promises that they will not affect ones from an ancient and wild gene pool. Here we go again. It is human to think we can trick nature, or do it one better. It is human to think a tsunami would never knock out a nuclear plant, a hurricane would never bury a city and a deepwater oil drill would never poison a huge body of water. In the gods of technology we trust. Until they fail. And then, we feel helpless and small and wonder what they -- or we -- were thinking. The fate of wild salmon and a panic over power plants that no longer answer to human commands would not seem to be interlinked. But they are, in the belief that the parts of the world that have been fouled, or found lacking, can be engineered to our standards -- without consequence. You see this attitude in the denial caucus of Congress, perhaps now a majority of Republicans in power, who say, in the face of all evidence to the contrary, that climate change is a hoax. The newfangled fish comes from AquaBounty Technologies, a company in New England, where many species of the water world are now extinct. 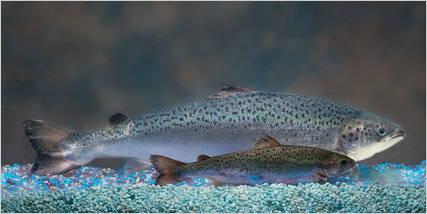 They have patented an "AquAdvantage Salmon," a sterile Atlantic female with a Chinook gene that can "grow to market size in half the time of conventional salmon," says the company. Consumer groups, and a bipartisan cluster of Congress that has not forsaken reason, are fighting fast-track Food and Drug Administration approval. They are also insisting that if the Frankenfish comes to market, the new salmon would have to be labeled transgenic -- over the company's objections. Wild salmon require so much work: they need clean water, a bountiful ocean and restraint to ensure that they aren't fished out of existence. Vigilance, and a small amount of sacrifice -- what a drag. The alternative, some feel, is to create something under human control. What AquaBounty would do is to take the Chinook gene and splice it into a farm-raised Atlantic. A third fish, an ocean pout, which looks like an eel on a bad fin day, would provide the genetic code that allows AquAdvantage Salmon to grow so fast. Voila: fast fish from the factory, without the hassle of habitat preservation. I'm not reflexively afraid of living better through chemistry. Genetically modified corn and soybeans have been around for some time. If we can grow food and fiber with less demand on water and nutrients, that's often worth pursuing. But the Frankenfish is a much bigger step, and not just because it opens the door to federal approval of all kinds of freaks from the farm. Splice a breast-heavy chicken with a pellet-loving pig and you're into some seriously modified "other white meat." With wild salmon, many people wonder what all the fuss is about. In the Northwest, salmon is our symbol, even if we've so mismanaged their spawning grounds with dams and overfishing. Where once there were perhaps 20 million salmon returning to the Columbia, that number now is barely a million in some years. Alaska has done much better. They have the world's largest wild salmon runs because they've protected habitats, kept water quality fairly good and regulated fishermen. These new salmon, AquaBounty says in its pleadings before the government, will not harm the ones handed down by the ages. There is "virtually no possibility of escape and interaction with the wild population," company officials say. Why do I not feel reassured? The last quarter century has bred skepticism into me, beginning with a personal experience in 1986. We were in Italy, my wife pregnant with our first child, when the Chernobyl nuclear plant blew. The Soviets lied, and covered up the accident. But what soon became clear -- that a runaway reactor had spewed more than 400 times the amount of radioactivity into the environment than that released by the atomic bomb over Hiroshima -- made us tremble. For days, along with the rest of Europe, we watched the pattern of a huge radioactive plume, as officials warned that pregnant women were at particularly high risk. Luckily, the radioactive cloud never came our way. But given the choice between the hard work of trying to respect the laws of nature, and the engineered solution, I'll take the seasonal miracle of wild salmon -- and try to learn something about humility.